Artist Bella Sinclair is holding a function at her art gallery, despite the best efforts of a figure in a clown mask to sabotage matters. But then a mysterious Englishman collapses at the sight of one of her paintings. When he recovers, he insists to DI Jimmy Perez that he has completely lost his memory. Before Jimmy can interrogate him further though, he vanishes. 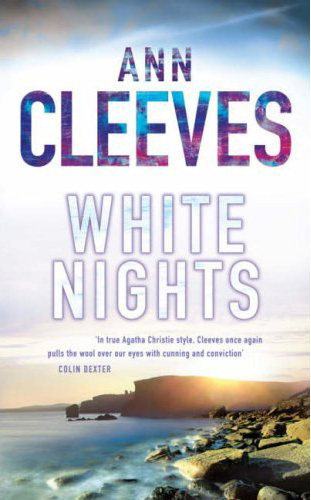 Right, I’m back from my holiday in Scotland, so why not start the (many) reviews that I need to write with a book set in the same country – the second in Ann Cleeves’ Shetland series, featuring DI Jimmy Perez. You may (unlike me) have seen the TV adaptation, but I always prefer to read the books first before watching the adaptations. I read Raven Black, the first book in series, about four and a half years ago, so you can basically consider me fresh to the series – I sometimes have trouble recalling details from a book that I read last week, let alone that long ago. Luckily, with the books that I read on holiday, I made a few notes. The author’s description of the Shetlands is stunning, bringing the small community to vivid life. Each member of the community has their own story which slowly reveals the big picture and a killer with a solid, sensible motive for the multiple deaths. The characters feel like real people with real, logical reactions to events. Plotwise, it’s not perfect – there’s a convenient moment when a character recalls something critical that ties a lot of threads together. There is a reason why said character didn’t recall it earlier, but it still felt like a convenient way to stall certain developments. Also, the killer seemed fairly inevitable to me, due to a lack of… Really hard to explain what I mean without blowing it – put it this way. It’s a trap that Michael Jecks has found a number of different ways of getting around in his mysteries, but that’s not the case here. Regardless, the mystery, unlike a lot of similar tales, is fairly clued, and despite me spotting the killer, the tale still delivered an emotional wallop. It took me four and a half years to return to the Shetlands – it certainly won’t be that long next time. Highly Recommended.